As we finish up our quilts, we sometimes forget the most important step of "signing" our work with a quilt label. 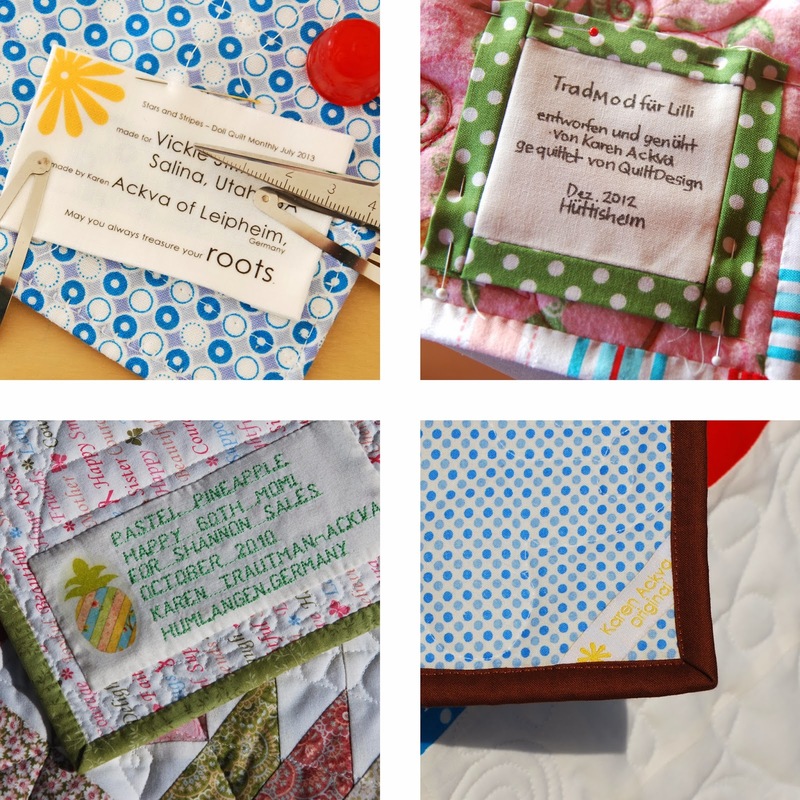 There are so many ways to make a beautiful label for your quilt, don't forget to do it! I have experimented over the years with different labeling techniques such as using a permanent marker, embroidery floss, designs on t-shirt transfers, iron on ink transfers and professionally printed labels. One of the easiest ways is to use a permanent fabric marker and write on a light piece of fabric and then sew this to the back of your quilt. I have never used a stamp, but would love to have one designed. I saw this quite a bit in Amish Country. I generally prefer to use computer generated designs on t-shirt transfers and then iron onto light fabric and sew by hand. 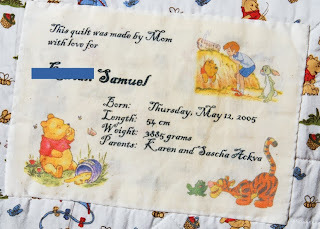 This gives me the most freedom to design a label according to the design of the quilt and personalize to the recipient. My problem here is the stiffness of the label, but as long it isn't majorly used, it won't interfere with the cuddliness of the quilt. Since embroidery is NOT my best trait, I usually prefer not to use this technique. 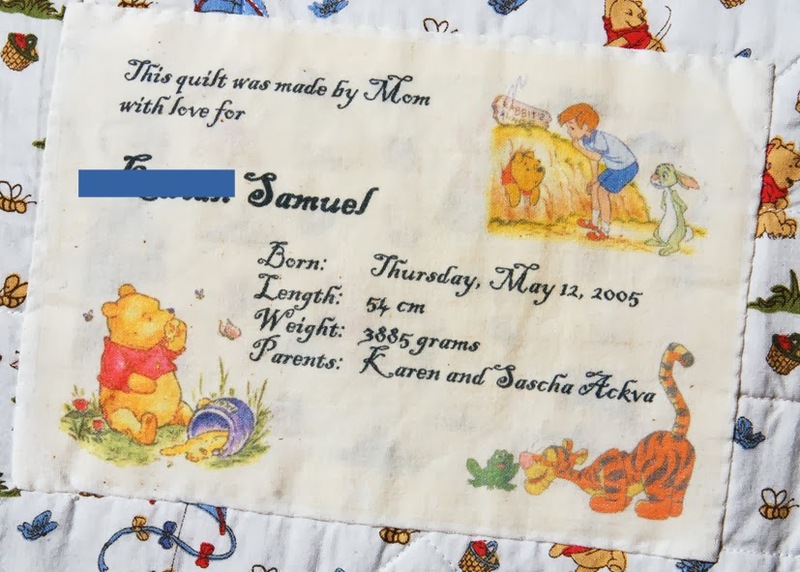 I love the work that some quilters bring to their labels by outlining in a fabric used in the quilt and then embroidering the information. Ich beneide diesen Kunst und die Kunstlerinnen. I don't have the patience. What is your favorite way to "sign" your quilts? Please leave a comment or link so we can all get inspired! Hi Connie! I am glad you found us. It is always nice to have a new face around. I also hope my post was helpful.